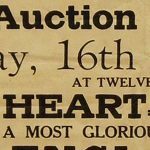 We came by this poster for the 1847 sale of Shakspeare’s (sic) House at an auction in Ballarat in 2012. 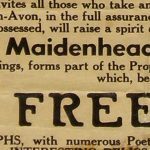 After a little on-line investigation, we found that a copy of the poster is also held by The Shakespeare Birthplace Trust at The Shakespeare Centre, Henley Street, Stratford-on-Avon. A veritable riot of fonts! True to the times, the poster uses a large number and variety of fonts. The use of ten different fonts for the one subject on a poster (measuring some 44cm x 56.5cm) is still surprising. What is perhaps even more surprising is the “age” of the fonts used – from a very crude sans serif in the headline (no wonder the term “grotesque” took hold), to a beautifully resolved geometric that pre-dates Paul Renner’s Futura by over 75 years, through to precursors – coincidental or inspirational – of, amongst many others, Bertram G. Goodhue’s Cheltenham Old Style. 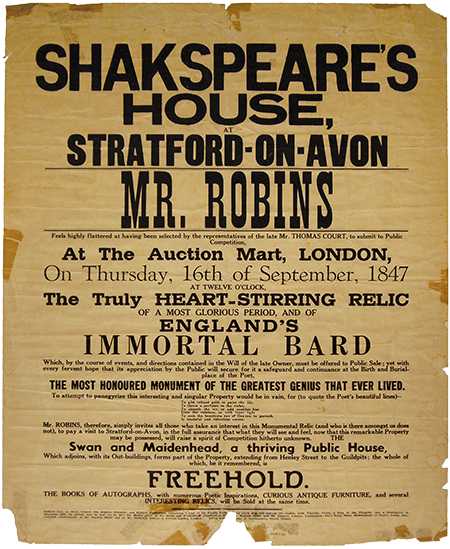 The printer was Alfred Robins of 7 Southampton St., Strand – perhaps the same Mr. Robins who was “highly flattered” to have been chosen to present the Immortal Bard’s house for auction. Using various resources (“The Encyclopaedia of Type Faces” by Jasper, Berry and Johnson and “An Atlas of Typeforms” by Sutton and Bartram for example), we’ve tried, to varying degrees of success, to identify the fonts used. 32 a precursor / similar to Parsons (ATF). 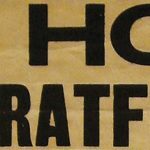 If anyone can provide more information to help accurately identify any of the fonts, please contact us – we’d be pleased to hear from you.